The Swainson's thrush is a medium-sized bird (to 18 cm long) with an olive-brown back and light, brownish-brey sides, and a buffy front dotted with dark spots. It has a prominent buff-coloured eye ring and buff lores (area of the face between the eyes and bill). The "russet-backed" variants found along the Pacific coast tend to have lighter spots and backs tinged with red. Its song consists of a series of flute-like whistles that spiral upwards from low to high notes. The Swainson's thrush breeds in moist, shaded areas such as coniferous forests, riparian woodlands, and swamps. Its summer breeding range stretches across much of Canada, Alaska, and the northwestern United States. It migrates south to winter in tropical forests. The Pacific "russet-backed" variants found on the Central Coast spend winters in Central America, while other variants travel further south to parts of northern and western South America. 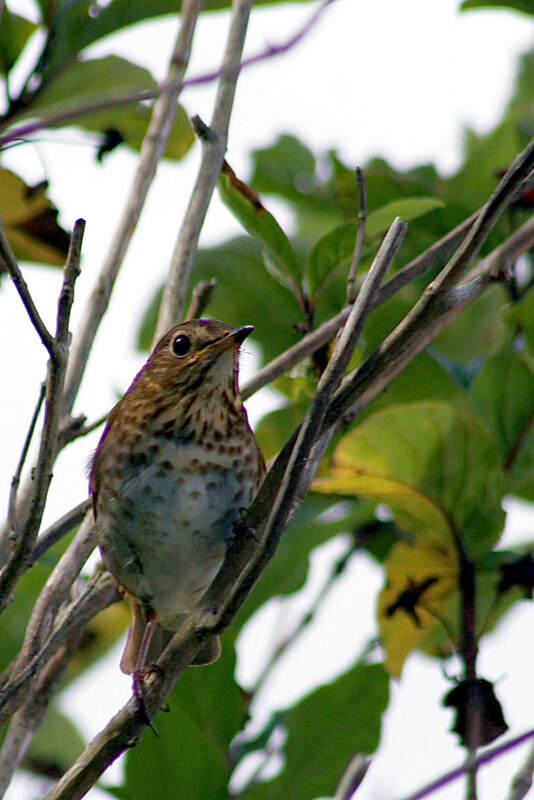 The hermit thrush (Catharus guttatus) is another medium-sized thrush with a brown back and spotted front. Its tail has a reddish tinge that stands out against its brown or grey-brown back, and it lacks the buff-coloured lores of the Swainson's thrush. Its eye ring is thinner and less distinct. Click here for a photo comparison. Its song is similarly flute-like, but does not make the same spiralling ascent as that of the Swainson's thrush. Dunn, J. L. and Alderfer, J. (Eds.). (1999). National Geographic Field Guide to the Birds of North America. (3rd Ed.). Washington, D.C.: National Geographic Society. Pp. 348-349. Swainson's Thrush. The Birds of North America Online (A. Poole, Ed.). Ithaca: Cornell Lab of Ornithology. Retrieved from the Birds of North America Online. Accessed 27/07/2013.